When it comes to science, the Mac has always been a heavy hitter when it comes to chemistry. Chemical research involves looking at molecules, and a picture of a molecule is always going to be more informative than just its name. In the '80s, the Mac excelled at displaying molecular files that had been computed elsewhere. But with the power of the G3 and G4 processors, now a desktop Macintosh can be a research-grade engine for chemical computation. Crystal Maker 4.0 and CAChe 4.1 are two new programs that put this power to brilliant use. This gleaming crystal can be displayed in CrystalMaker as a rotating 3D structure, floating in front of your monitor. From huge DNA fragments to small molecules like aspirin, hard information about chemical structure comes from a method called x-ray diffraction, applied typically to small samples of crystalline material. CrystalMaker 4.0 specializes in building and displaying such images of crystal structures, assembled by "repeating" molecules many times at precise distances and angles. The procedure typically starts with a user entering atoms and their coordinates in a crystal unit cell, using CrystalMaker's crystal data editor, which speeds up data entry quite a bit. The user can specify display in space-filling, ball-and-stick, wireframe, and polyhedral modes, impose surface plots on the ball-and-stick display, annotate particular atoms in the crystal, and switch around instantly among all these modes. Besides building crystals from your own data table, the program imports many different data file formats -- a great help in the somewhat bewildering world of incompatible molecular database files (CCL, Chem3D, CIF, CSSR, FDAT, ICSD, PDB, SHELX, STRUPLO, and MacMolecule). CrystalMaker also includes a companion program, CrystalDiffract LE, that predicts the x-ray diffraction pattern for a given crystal structure (researchers will probably want to get the upgrade ($215) to CrystalDiffract Pro, which offers more options and diffraction types). CrystalMaker is easy to learn, and includes the most comprehensive and best-produced manual I've seen for a science product in years, but oddly for scientific software, its real attraction is aesthetic. It makes the best-looking crystal structures imaginable. Special attention to reflection, shading effects, and depth fading puts CrystalMaker ahead of competing programs for vivid display, and its floating 3D representations (viewed with red/blue glasses) are dazzling as well as instructive. 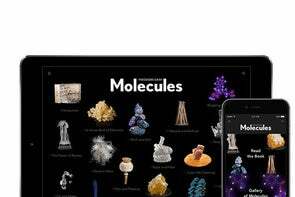 CAChe 4.1, in contrast to CrystalMaker's single-minded focus on molecules in crystals, provides modules to calculate nearly every aspect of molecular behavior. One of the first Mac science programs, CAChe is now distributed by supercomputer maker Fujitsu, and its design shows careful effort at fitting G4 computation into the world of still-bigger computers. In CAChe, you typically start by assembling a 2D version of a molecule from a library of fragments, using an editor that's much like a drawing program that understands the rules of chemistry. CAChe then turns this 2D picture into a 3D molecule by assigning realistic atomic radii to all atoms, realistic bond lengths to all bonds, and then finding a minimum-energy conformation of the molecule using a molecular-mechanics program (CAChe uses a library of molecular-mechanics parameters refined over the last decade) to search over possible conformations. The next step up in realism is determination of a molecule's quantum-mechanical properties, using the programs grouped in version 4.1 into Quantum CAChe (CAChe 4.1 includes Personal CAChe, Quantum CAChe, and CAChe WorkSystem and CAChe Satellite for interacting with servers and other software). Using the molecular orbital packages (MOPAC and ZINDO) of Quantum CAChe you can develop a color-coded image of your molecule that displays partial charge separation, molecular orbitals important for reactivity (highest occupied, lowest unoccupied), and derive most sorts of useful spectra (UV-visible, infrared, nmr) from the electronic structure. Using the CAChe application Visualizer+, the results of these quantum calculations can be viewed as color-coded surfaces, superimposed in 3D over framework chemical structures. There's a reasonably long learning curve associated with mastering the entire CAChe suite of computations, but for a research application at this level of sophistication it's remarkably easy to begin experimenting. It's also a fairly simple matter to make a QuickTime movie showing a molecule's orbitals and the way these orbitals participate in reactions as chemical bonds rotate and stretch -- it's the closest you can get to seeing a reaction in progress, and your Mac can do the calculations, not just the display, for small to medium-sized examples. CAChe 4.1 now also supports communication with routines (Vamp, CONFLEX, Dgauss) capable of handling the largest molecules. Textbook publishers in chemistry and geology should simply hire CrystalMaker to replace all their illustrations with glossy color plates and QuickTime movies. CrystalMaker 4.0 is without question the most glorious tool for chemical structural work yet produced by anyone. CAChe, really a suite of computational modules rather than a single program, provides the latest methods for predicting conformation and reaction properties of new molecules. Besides Mac computation, CAChe provides interfaces for supercomputer-based programs for bigger jobs. PROS: Beautiful output, simple to use. CONS: Web support only (in U.S.). Company: CrystalMaker (+44 1869-369393, www.crystalmaker.com). LIST PRICE: $499 ($350 academic single license, multi-user discounts). PROS: Updated versions of classic computational chemistry. CONS: Many separate programs with separate interfaces. COMPANY: Fujitsu (503/531-3600, www.cache.fujitsu.com). LIST PRICE: $495 (academic and industrial licensing programs).